How to make Co2 Laser Marking Engraving Cutting Machine with Red Light Positioning? As we all know, the fiber laser marking engraving cutting machine has the function of Red light positioning. It is a natural function that fiber laser marker doesn’t need to install anything. The Red light could help positioning the area that needs to be marked or engraved. This is really a very good character of the fiber laser. Co2 laser marker engraver or Co2 laser cutter, with the co2 tube laser source, unfortunately, doesn’t have the red light positioning function. Actually, most of us are accustomed to Co2 laser machine without red light positioning. When we use Co2 laser marker engraver cutter, we need to test several times to get the right size and right position before formal marking, engraving or cutting. In order to solve this problem, there is a new technology and device that comes out. 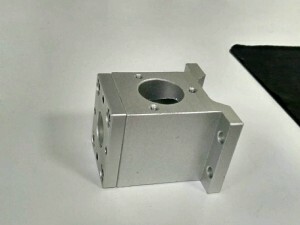 The right light positioning device for co2 laser machines. 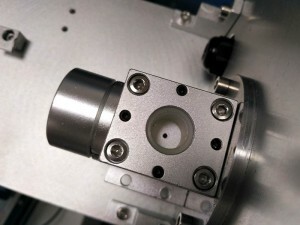 This device including a small metal assembly and a small lens fixed into this metal assembly for reflecting the red light to the processed materials for positioning function. It is best to install this red light positioning device in the first time manufacturing assembly process of co2 laser machines. Someone would ask, can I install this device onto my finished co2 laser maker engraver or cutter machine? The answer is Yes. But it is a complicated and hard process. As it is near the co2 optical devices and laser tube, the installation needs to be very careful and need a professional technical person to do this. Now, most of our customers are asking for the red light positioning function for the first time buying co2 laser machines, even the cost will be raised a little higher. This red light positioning function would be more and more applied to various kinds of co2 laser machines: Co2 laser marking engraving machine, co2 laser cutting machine. 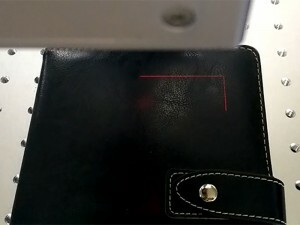 Here let’s take a look at a video of red positioning laser marking on leather cover of a notebook with co2 Laser marker with this red positioning function. Why no Laser Beam Output for Co2 Laser Cutting Engraving Machine?